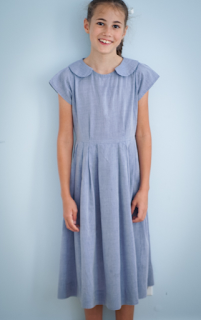 Sewn for Daisy earlier this summer out of a very light, silky chambray. I don't have a go-to pattern for her at the moment so this is very much a mishmash of various elements to get the pleated skirt and the semi-Peter Pan collar I envisioned. Very nice dress. Looks good for twirling. Any photos like that. Goodness ~ she has gone and grown up! She seems very happy with it. 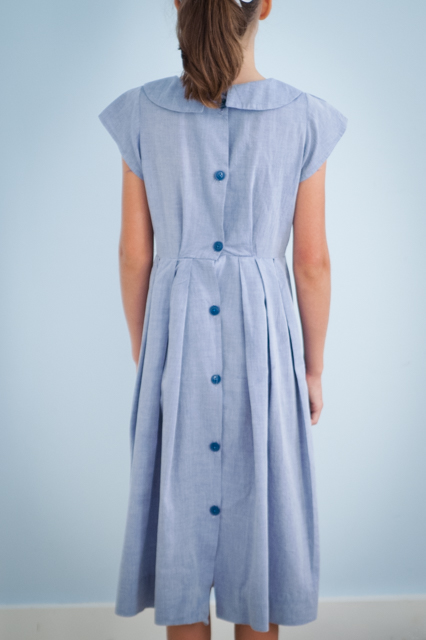 I love things that button down the back - they have such charm. It's very sweet. The chambray is probably very cool in the Southern heat.